Way back in the early Eighties Avenger produced two solid metal albums: 1984’s ‘Blood Sports’ was imbued with the lifeblood of the NWOBHM, while its follow-up ‘Killer Elite’ saw the band evolving in pace with the changes in the metal scene at that time, the result being a sharper, faster beast altogether. The band regrettably split after those two albums, and although there have been a few false starts since, they’ve never been able to harness what made Avenger so exciting back in the day and unleash it once more. Until now, that is. 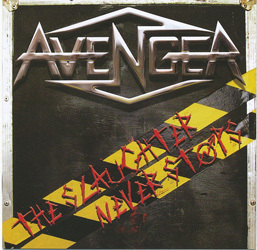 Evocative though its title is, ‘The Slaughter Never Stops’ should really have come out under the title ‘Heir Apparent’, given that it fits nicely into the band’s catalogue and seamlessly blends the core elements of those previous two albums into an electrifying, homogenous full-on twenty-first century metal assault. ‘The Slaughter Never Stops’ is an album that defines controlled mayhem. It’s a bruising, boisterous affair, and angry too; ‘Into The Nexus’ is as fearsome a pugilist as you’d wish to encounter and de facto opener ‘Race Against Time’ is as heavy as they come: all things considered ‘The Slaughter Never Stops’ is certainly an album you wouldn’t want to meet in a dark alley. But despite its overt freneticism it’s an album that teeters constantly on the edge without ever slipping out of control. These boys know both when to hit the gas, as well as the precise moment to rein it all back in. And if a shedload of hard-hitting songs isn’t a selling point in itself, the album’s other strength is that it reunites dynamo drummer Gary Young with the band’s charismatic vocalist Ian Davison Swift. Alongside the pair Liam Thompson and Sean Jefferies handle the guitar duties with admirable panache while Ian Fulton keeps things rhythmically locked ‘n’ loaded. Like the band, the logo’s had an update too while remaining true to the original, and the same can be said of their cover of ‘Killers’, slipped neatly into the running order after the Maidenesque ‘In Arcadia Go’. It’s true that you can’t turn back the clock, but you can at least pick up where you left off, and with ‘The Slaughter Never Stops’ Avenger have done just that. Not so much an album as a statement of intent that they’re back in business once more. Let the blood sports commence!